Modelers will always understand each other. A minute passed, and mark and Mihalski usikova overcame the barrier and began to argue about the benefits of “super-tiger” on the “Mogami”, about the prospects of EN-route automodelisme, I began to touch the names of friends of the athletes — participants in international meetings. It happened in Warsaw (the delivery of goods from Poland), in the city model club LOCK (Liga Obrony Edge — defense-voluntary sports society pnrm.). Club as a club. Similar to our domestic. The same machines, the same smell of ether and nitromethane, the same skeletons of models in glazed cabinets. Similar — and dissimilar. Depot that in Poland there is no such strict distinction modelers with the same interests as we do. We’ve got a if you’re interested in “air”, go to the model airplane club, get the materials, engines, build your model, take part in competitions. Will work — there will be a podium and prizes, and sports titles. In Poland modelers has not yet officially recognized. They are not subject to the provisions of the unified sports classification, and sport titles are awarded to them. This is despite the fact that Polish modelers successfully perform at major international competitions, among them (especially in modeling), there are Champions, and world Champions and Europe. Notice, incidentally, that the modelling in Poland a mass phenomenon. Only in the competition of LOK in different classes participate each year more than 26 thousand children! Different types of modeling are taught in schools almost on a par with other subjects. And the latest trends in technical sports in this country are picked up from the fly find its adherents. That is, of new beginnings, the Polish modelers-athletes, I would like to tell. “Svento of latavra” — “the Holiday of a kite”. The so-called popular among students and most massive in the number of participants. Guys… start with ordinary snakes. However, not quite ordinary. Designs that they create, far, far away from those “letters”, which we ran in childhood. Complex architectural structures, resembling the nozzle of the rocket, a modern house of glass and concrete, even the airplanes of the era of the birth of aviation (no motor, of course), up in the air over the villages and towns of Poland in the days when are held the competitions. They are organized as a real sports performance — with the jury, with clear rules and, of course, with a lot of spectators and fans. The contests are held at the highest altitude snake on speed… Then we need to make a clarification: the young Modeler by running the snake, running with him on a certain track. And it was his running speed and determines the winner in this contest. Is offset by the ability to control the kite. Polish master of sports believe that the best initial form of training for future korovikov and air fighters. The finale of the competition for the prize of “Svento of latavra” are competitions conducted at the airfield Central aeroclub of the “League of Defense” (LOC) is a Polish military and sports volunteer. Many of the guys who made, thus the first step in the sport, not breaking up with him in subsequent years, becoming a model aircraft. Head of Department of modeling of the Main Directorate of the Aero club of Poland Zdzislaw Shaevskaya says that those who engage in modeling can come in any of the 40 clubs in the country, where there are sections of model airplanes. Here to their services and the necessary equipment and materials, and engines, and the advice of experienced trainers. Training leaders of technical creativity here pays a lot of attention. Can not do without numbers. Every year in LOK receive such training no less than 300-500 teachers, trainers, social activists, Methodists Palaces of Polish (Polish — Polish pioneers). This means that every year in the palaces, schools, clubs are becoming more and more skilled mentors who are able to skillfully and efficiently prepare children for mastering the skills of design, to teach, to instill in them a love for experimentation, to work with drawings, wood and metal. Add to this only that Polish modelers are not experiencing any particular difficulties with the supply of materials. They also have balsa, is and engines. Especially popular is our, Soviet “MK-12”, “MD-5”. the Museum of science and technology, in Krakow’s Museum of aviation and Astronautics. Speak for themselves and thousands of copies of books on aviation, published here. — We believe that the present pilot, aeronautical engineer, you can prepare only from the number of boys who passed through the school of model aircraft in his youth fell in love with the sky and consciously preparing yourself to work in aviation long before it became a profession. That’s why we jointly with the LOC, together with the educators take the time and money to raise reliable, dedicated aircraft frame. LOCKE manages and Warsaw model club, which commands A. Michalski. But it is not just the Director. Man, utterly in love with four-wheeled equipment, flooding streets and highways, and the hobby he has chosen close to the profession. This fascination, of course, automodelisme. A little sheepishly he nodded to the glass door, behind which lined up a well-worn racing. My. But it is completely and forever gone. Developed and uninteresting. I have always been irritated in the “classical” automodelisme attachment to a rope, and the conditional nature of the competition, limited prospects and, most importantly, distance from the main for us — working with children — things: prepare to the choice of profession, to mastering its basics. — So instead of automodelisme? Why “instead”? He, automodelismo — only RC! — I do not understand that can you, the rider, to engage in these, though interesting and constructive, but slow-moving cars? — Everything you need to the athlete, there is in these machines — continued other athlete, R. Hejduk. — Complex design of the chassis, thin and precise actuators works over a machine finish. And at the same time, the excitement of these competitions. This is not a consistent run one race after another; three, four… ten cars are broken from the start and rush for a hundred-meter track, engines roaring, accompanied by the cheers of the fans. It requires not only the skill of the designer, but also excellent driving skills. That’s why in high-speed radio-controlled models I see the future of our automodelisme. It’s not just words. Poland has already started. Time to get to us. 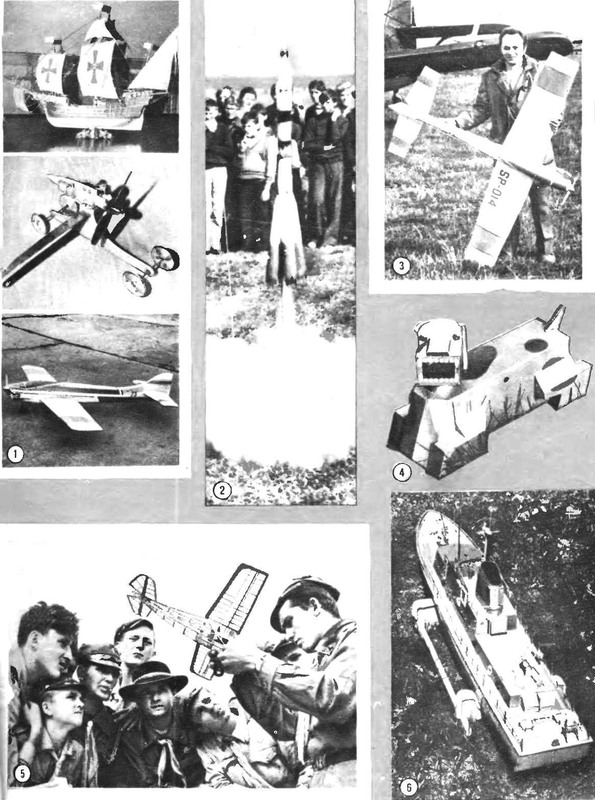 And for those athletes who wish to construct high-speed radio-controlled models, we print in this number drawings model described in the book by the famous Polish specialist in the field of radio, the repeated champion and the champion of Poland Janusz Wojciechowski. I was never lucky enough to see the pattern on the go, but according to experts, it is made quite “at the level of world standards.” As soon as the first model of this type will be built in us, the magazine arranges a match meeting on high-speed radio-controlled models (of course, with the support of the Federation of auto modeling sport of the USSR). So it will be the beginning of one more, and today perhaps the most promising model sport. The love of experimentation inherent in the Polish modelers. I can say with confidence because I’ve seen for a few days in the Polish people’s Republic the quest Wolski modelers in a variety of ways. Just gonna list some: the construction of models of seaplanes, hobby models, RC gliders, an entirely new approach to competition in the railway modelling finally, much work in modeling space — all this can be safely recorded in the asset Polish athletes designers. Each year, stronger ties in all of these sports between the Soviet and Polish modelers working in common purpose — in the name of scientific and technological progress of our two fraternal countries, in the name of training of creative workers in the different fields of the national economy of the socialist countries. 1. Ancient ship, sleigh, speed RC model airplane. During their creation were used drawings of our magazine. 2. On sapolsky competition for space modeling. 3. Champion of Poland A. Michalski — head of aeromodelling laboratory of the Warsaw Aero club LOC. 4. 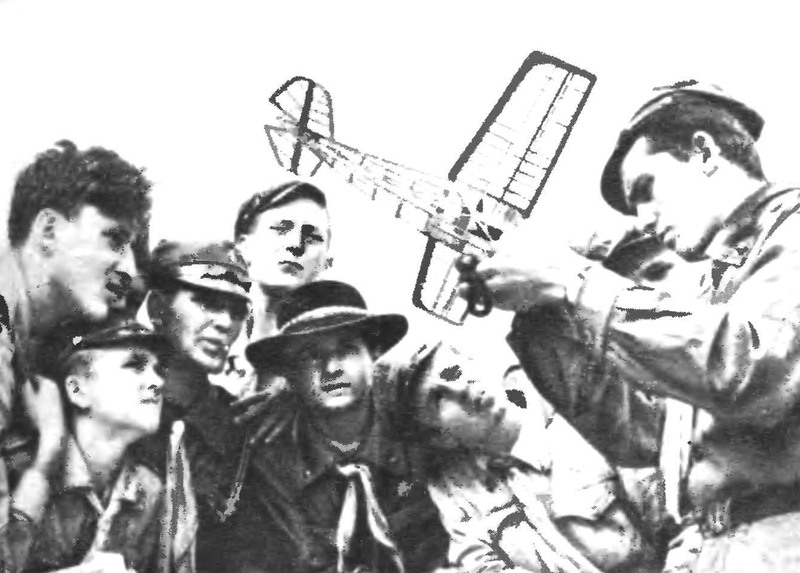 The youngest model aircraft — the Polish pioneers. 5. Model of the Polish cargo ship.